Your kiddo will light up the room wearing the Dolce & Gabbana Kids® Back to School Jersey T-Shirt. Crew neckline. Short sleeves. Ladybug and floral graphic throughout. Buttons at the back of the neck. Straight hemline. 100% cotton. Machine wash cold, lay flat to dry. Made in Italy. This item may ship with an attached security tag. Merchandise returned without the original security tag attached or a damaged tag may not qualify for a refund. Measurements: Length: 13 1⁄4 in Product measurements were taken using size 2T (Toddler). Please note that measurements may vary by size. Your kiddo will light up the room wearing the Dolce & Gabbana Kids® Back to School Jersey T-Shirt. 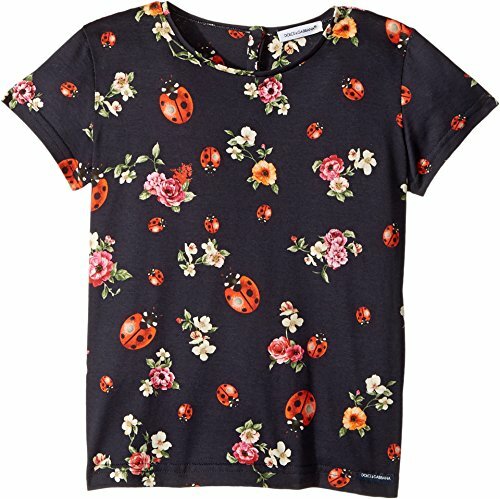 Ladybug and floral graphic throughout. Buttons at the back of the neck. Straight hemline. 100% cotton. Machine wash cold, lay flat to dry. Made in Italy. This item may ship with an attached security tag. Merchandise returned without the original security tag attached or a damaged tag may not qualify for a refund. Measurements: Length: 13 1⁄4 in Product measurements were taken using size 2T (Toddler). Please note that measurements may vary by size.